Spotify’s core mission is to build a new music economy while making sure artists get paid, but these aspirations aren’t obvious to most of its users through the user experience of the platform. To remedy this, I proposed a feature that allows fans to make direct contributions to their favorite artists, to strengthen Spotify’s brand value, get more engaged users, and help independent artists grow their careers. After presenting to a member of the Spotify team, I was able to get insight into how Spotify might incorporate a feature like this. The first step was to understand what Spotify’s core mission was and whether or not their existing services aligned with their brand values. It’s easy add features that make product more “fun” or “interesting,” but I really wanted to get to the core of Spotify’s reason for being, and use experience design as an opportunity for creating brand value. The last step was to examine Spotify’s business model, since the way a company operates and makes money usually complements their mission or values. It was disheartening to see how small of a percentage artists get paid. For bigger artists, their revenue was obviously far greater, but what about independent artists? How could I use Spotify as a platform for helping independent artists grow? Get an archived playlist of songs exchanged between you and your friends. Show users Spotify’s core mission through an experience with the platform while increasing loyalty to the brand. Align the new feature to Spotify CEO’s mission to “rebuild the music economy and creates more brand value. This location adds a tab to the artist’s page, but my dashboard would need to include information that was more specific to contributions rather than artists. This location was most relevant to the songs or playlist, rather than added features like my Contribute button. This location made the most sense for my feature since it was easy to access and the buttons in this zone are not click-through buttons, but function more like on-off buttons. While the Contribute button was a simple tweak to the artist pages, I knew I would need to add a dashboard for people to see where their contributions went. I studied Spotify’s existing content structure and mapped it out, and figured out where it made the most sense to add my proposed Contribution dashboard. I then moved on to mapping how specific tasks I wanted users to be able to accomplish from the dashboard. 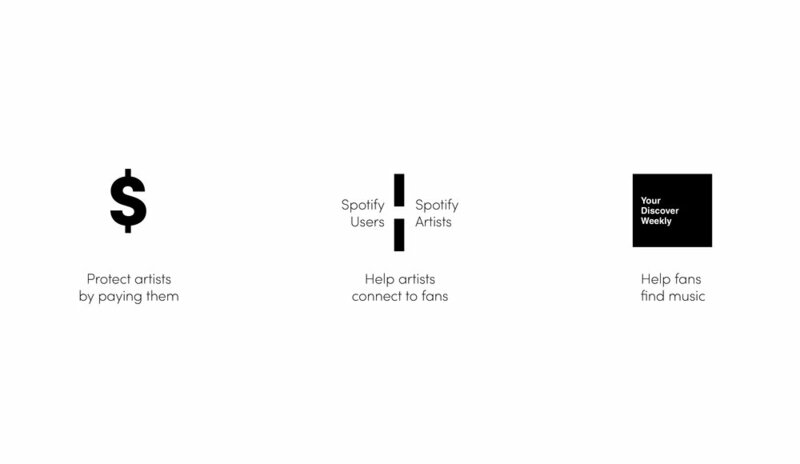 I listed them out and then mapped out how my dashboard would integrate with the rest of the Spotify platform. 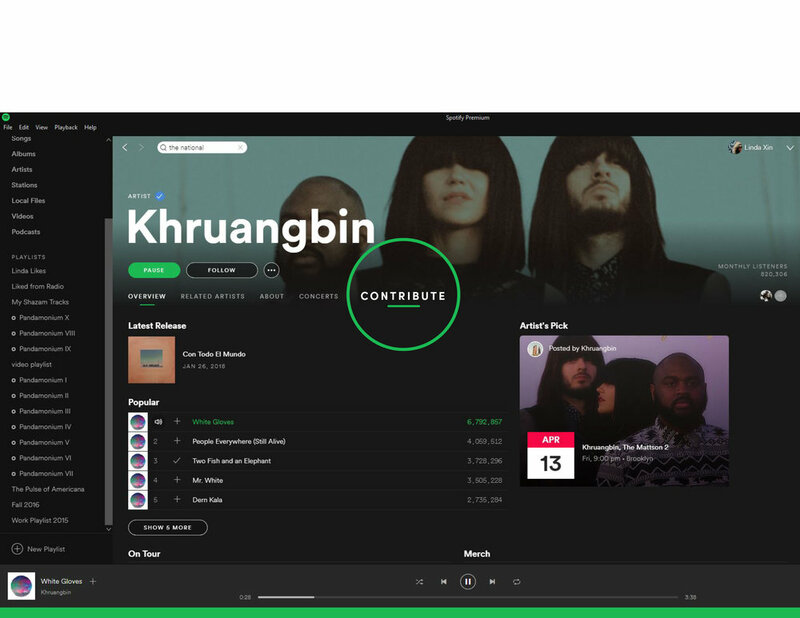 While the main feature is very simple, it requires some settings for the user to feel comfortable with participating in this new Spotify experience. I mapped out what this experience would be . The current Spotify website does not talk about its mission or values. Most of the research I found about their mission was through press releases that contained direct quotes from Daniel Ek, Spotify’s CEO and founder. Most people won’t do this extra digging, to find out about a company. One of the ways to enhance Spotify’s brand value is to show their users that they stand for something greater than just music streaming. The new ‘Contribute’ button contained under each artist’s name, so that users can easily press it if they want to start their contributions, or unpress it if they want to stop their contributions. The button turns green when the user is currently contributing, very much like the existing ‘Pause’ button.